Nickname(s): Morri, “Mo” (don’t call her that). Like her parents, Morrigan has a rather large ego and likes to brag about her accomplishments. But her insecurities shine through, especially where her mother is concerned. Having a powerful, balloon-breasted fire-breathing Amazon for a mother and NOT inheriting any of the aforementioned traits tends to leave a person just a smidge resentful. Malicia doesn’t help matters as she will unintentionally embarrass and degrade her daughter at any given time, particularly when they’re out in public together. As a result, Morrigan is extremely snarky toward her mother and will blatantly disrespect her. In fact, she will often talk to Malicia in the same manner Negaduck does, which is to say, not very nice at all. Morrigan tries to embody Negaduck’s aggressive personality, but hasn’t quite mastered it yet. She is unable to strike the same sense of fear into those around her, although she has proven herself as someone not to be trifled with. She is more of a tomboy but shows some occasional girly tendencies, especially when it comes to her crush on Travis Crackshell. Don’t ever comment on the flatness of her chest unless you want to spend the evening dodging a barrage of bullets. Conceived in a bank vault during a particularly memorable heist, Morrigan is the daughter of “Demon Queen” Malicia and Public Enemy #1 Negaduck. As you could probably guess from her unfortunate parentage, Morrigan was not exactly ushered into the world with loving affection by either of her progenitors. Negaduck, who had absolutely no desire whatsoever to play the daddy role, left all of the child-rearing to his narcissistic partner. And while Malicia was more than excited to have a baby, it was for all the wrong reasons: It was all about herself, and the desire to have a miniature Malicia that could admire and idolize her. But responsibility was never Mal’s strong point, and Morrigan brought literal meaning to the phrase “raised by wolves”: She was often supervised by Mal’s Familiar, Pringles, and Negaduck’s pack of dobermans, who ensured that the infant didn’t put herself in harm’s way. Malicia wasn’t entirely neglectful however, she made sure to teach her daughter the important priorities in life… which was why Morrigan could mix cocktails before she was potty-trained. Morrigan was, by nature, a resilient and intelligent child, which was why she was able to thrive so well with a selfish, insensitive mother and an absent father. She did not inherit any of Malicia’s abilities, including her mother’s (ahem) more sizable assets. She takes after Negaduck, with a keen instinct and the talent to turn just about anything into a deadly weapon. She has particularly excellent marksmanship, rarely missing her target. Being small and agile also allows her to move quickly and often remain undetected. As she grew older and showed promise in the field of villainy, Malicia, unable to relate to her daughter’s non-magical abilities, insisted that Negs tutor their daughter in basic evil-doery. Negs wasn’t particularly thrilled with the idea of baby-sitting, but was also quite attached to his limbs and didn’t want to part with them anytime soon. Fortunately Morrigan proved to be a fast and efficient learner, and she never tried to force any level of father-daughter relationship out of him. 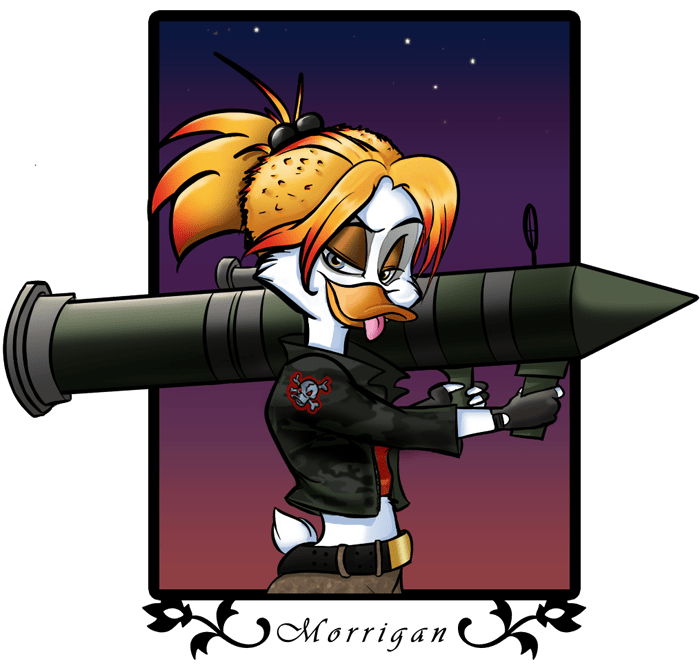 As a result, Negaduck tolerates her existence and — due to genetic instinct and his own ego — feels some sense of pride that his offspring will continue his legacy of arson, cat-kicking, sidewalk-spitting, and other important pass times… so long as she doesn’t steal his Public Enemy title out from under him. But a greater challenge awaits Morrigan: Boys. Or more specifically, one boy; a handsome high school Quarterback by the name of Travis Crackshell. It really doesn’t help that he is the son of Gizmoduck and has donned the Gizmo-armor to fight crime. Caught on opposite sides of the law, it’s a classic Romeo & Juliet situation that is sure to end in tears and broken hearts (and bones)… at least if Malicia has anything to say about it.